One day Barbara (of Me, My Dog...and my RV fame) and I went to visit the Palatki ruins, 7 miles down the road we are parked on. You must schedule a tour to see the ruins. The ruins were built from 1100 to 1400 by the Sinagua people. You can no longer walk through them, but can walk right up to them. There is another trail to see the pictographs and petroglyphs, which you can visit without being scheduled for a tour. Back at camp, balloons were still landing almost every morning. My almost-3-year-old granddaughter happened to Facetime me right when they were landing, so she got to see them too! I moved over to an area between Cottonwood and Camp Verde to meet up with the WINs. It was still close enough to Sedona to go on the trails there. I took them on the Teacup Trail, my favorite. Only the third time I've done it this year! Arriving back at the trailhead. On Easter, we had a Potluck, with ham, turkey, and all the trimmings. Balloons go over this area too! It was a great visit to one of my very favorite areas! Barbara and I went early to the Chapel of the Holy Cross. While waiting for it to open, we got a view of Cathedral Rock and a gigantic mansion. WOW! Also got to see Bell Rock in the distance. Amongst the red rocks of Sedona. I like to look at the Stations of the Cross in different Catholic churches, and these were definitely some of the strangest I have ever seen. They were made out of old railroad spikes. But I did get cozy with Albert Einstein. There were some beautiful bronze statues there. Afterwards, we drove up Schnebly Hill Road, where 8-10 Javelena crossed the road in front of us. WOW! Sedona and the surrounding National Forest have a ton of excellent hiking trails. One day, I took off on the Soldier Pass trail, which I tried to do last year, but it was closed. Just a short distance from the trailhead is a huge sinkhole. I was looking for the Seven Sacred Pools, and I found them! Almost every morning, hot air balloons landed right near us. This one was huge, with 15-20 passengers! They managed to get it down without landing on Don and Donna's rig. We're parked near a model airplane field, so one day we went over to watch. We had a long talk with the club president, shown here. This was the biggest plane, which would go up and then dive down, spinning as it did. It was quite entertaining. Escaping the cold weather in Payson, I moved on to Sedona. The weather here was perfect. We had a brief storm the first day I was here, but it produced a beautiful rainbow. I'm parked here with my friend, Barbara, of "Me, My Dog, ...and My RV" fame. And let's not forget cute little Katie! Barbara had never seen the Amitabha Stupa in Sedona, so off we went. I could tell we were close by all the prayer flags. A Stupa is "the physical embodiment of the Buddha's enlightened mind." You are to walk around the Stupa at least 3 times while making personal wishes and prayers for the welfare of suffering beings and world situations. You can see a well-worn path there. I did it and made my best wishes. There is a beautiful statue of Buddha behind the Stupa made out of wood. Chimney Rock is in the background. There are lots of offerings scattered around. 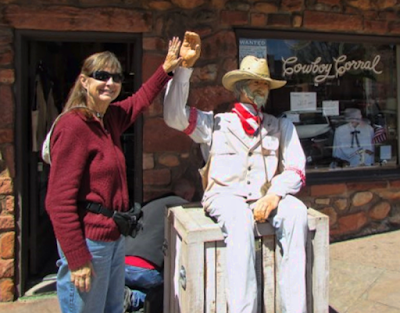 Afterward, we walked around the center of Sedona and looked at some of the statues. I like this one of the rusty guy painting, and the little girl taking a picture of him. And of course, Sacajawea, which reminded me of our Lewis and Clark circuit in 2010. High five with the cowboy! And we met Zeus, the cutest dog ever, in his "doggles." The "Hairalinas" were also adorable. I love this area, and there is lots more to come! It was getting a little warm in Apache Junction, so I headed uphill to meet up with the WINs in Payson, AZ. Our first outing was to the old school house in Strawberry. Built by pioneers in 1885, it operated until 1916. It's the oldest standing school in Arizona. We tried out the seats, and enjoyed the knowledge of the 90-year-old volunteer who rushed over to open the building when she saw us all standing around outside. Afterwards, we went on a hike on the Arizona trail. There were too many trees for my liking, so our group didn't go too far. On another day, we went to Tonto Natural Bridge State Park. From this side, there was a little waterfall over the bridge opening. And from the other side, you could almost see through the opening. The bridge is 183 feet high over a 400-foot long tunnel that measures 150 feet at its widest point. It's believed to be the largest natural travertine bridge in the world. We didn't hike down to the bottom, but this is the view from the bottom - my picture of a picture. Afterwards, we went to the nearby Water Wheel waterfalls. We only went about a third of a mile, because to go farther you have to walk up the creek. But we did manage to see several small waterfalls. And then on the way home we stopped at the Shoofly Village ruin. A thousand or more years old, it has not been restored, which I liked. I may have gone uphill a little early. One day, the high was 48 degrees, so I moved on before the gathering was over.